In an effort to put our basketball program into perspective, I will be occasionally making some comparisons this season. The first has to do with the notion that Georgia's current basketball ineptitude is a product of the Harrick regime's scandal and disregard for any notion of integrity. As you will recall, Jim Harrick and his son won a lot of basketball games at UGA. But any achievements on the court were badly tarnished (and eventually rescinded) by their actions off the court. In the last few weeks of the 2002-2003 season, Jeremy Schapp reported on major academic compromises in favor of the basketball team and payments to players (Tony Cole) and their friends. The result of the story was a cascade of horrors: no post season for one of the best Georgia basketball teams ever, the program being the subject of late night comedy monologues (how many points is a three point basket worth? ), the resignation of Harrick and his staff, and NCAA sanctions. The scandal thumped the basketball program. The team had seven scholarship players in 2003-2004, but still somehow managed an NIT slot. The next year, the effects of scandal really hit home as the team went 8-20. The Dawgs snuck back into the NIT in 2006-2007, before last year's miracle run earned the team its first NCAA appearance since Harrick left. In contrast, I present the Baylor Bears. There are likely two things that readily appear in your mind when you think of Baylor athletics: Mike Singletary and that one of their basketball players shot and killed a teammate in 2003. The investigation into the murder yielded all sorts of dark, seedy truths, eventually forcing coach Dave Bliss to resign and sending forward Carlton Dodson to prison for 35 years. For Baylor's basketball program, the result was five scholarship reductions, recruiting limitations, and five years of probation. The NCAA also found that the Baylor administration lacked institutional control of the basketball program, as severe a finding as the NCAA can make. Because Baylor was a repeat offender, it was eligible for the death penalty, but the NCAA spared the Bears. The year after the scandal, Baylor went 8-21. Per their NCAA penalties, they only played a conference schedule in 2005-2006 going 4-13. Baylor continues to be on NCAA probation. I think we can all agree that the Baylor scandal, by any reasonable measure, was far worse than the Harrick debacle, both in terms of the actions that produced it and the cumulative penalty imposed as a result. Our punishment for the Harrick scandal was mild in comparison: three scholarships were forfeited from the '05-'06 through last season, one in each year, public ridicule, and the release of a large recruiting class. We also got four years of probation, which ended last year. All three scholarships, however, were reinstated after a successful appeal by the university in 2005. The NCAA's rational for this reversal was that all but one of the signees in Harrick's final class decided to go elsewhere when the university granted them all a release. The NCAA decided this was punishment enough and lifted the scholarship sanctions. So, where are these program's today? Baylor is currently ranked #19 by the AP after last season's 21-9 record and NCAA appearance. The Bears are 11-1 so far this season, including a win over #17 Arizona State. Georgia is 10-4 9-5 and our most impressive win was over Virginia Tech. I point these facts out simply to show that if one believes that the Harrick scandal still holds this program down, they are mistaken. We are past the point that the NCAA sanctions have a legitimate effect on our program. After all, our penalties were far less severe than Baylor's, yet Baylor is vastly outperforming our basketball program. Our struggles have little to do with the NCAA violations earlier this decade. Point taken. But you and I both know full well that Felton bought himself another year at least with those 4 wins last year, and now if he lands Favors he'll get at least 1 more as well. No matter what, we're stuck with him if Favors lands at Georgia (I mean, please do come here!). I say who cares about what recruit is coming or not. What does it mean? We continue to stay at the bottom of the conference, perhaps move up to the middle while this recruit is here for 1, maybe 2 years? For the long term success of the program its time to cut ties. Favors is down to GT and UGA and both teams have struggled mightily thus far. Either way he goes, he will probably end up saving a coach's job....so basically my fellow Bulldawg brethren and I are torn between landing Favors and keeping Felton or losing Felton and losing Felton. Is there a scenario that exists where we can fire CDF and land Favors? Are Felton and Favors that tight? This is anon at 12:35..I meant to put Favors name in the losing Felton and losing Felton part... My mistake. Go Dawgs! Quinton we are 9-5. I really hope we got out and get a good coach. The talent on this team next year remindes me of the team that pearl inherited at UT his first year. We can get a good coach in here and he can take off running with the program. The biggest story coming out of the the Baylor scandal was Dave Bliss's successful transistion from disgraced head coach to overachieving UGA center. Good for him getting his life back together. Harrick did ruin the program. Quinton's point isn't that he didn't. The point is...that isn't the excuse to STILL be struggling. As for Favors, I'm not sure that Favors saves Felton's job without at least an NIT appearance. And signing day isn't until April 15th or so. A full month after the SEC Tourney ends. Great post. I hate hearing people blame our on-court ineptitude on Harrick's era. There are many other things that hold us back, namely 1) lack of any coherent offensive scheme; 2) lack of on-court discipline, regularly leading to 20+ turnovers and team foul trouble; 3) horrid foul shooting; and perhaps worst of all, 4) off-the-court discipline ruining players' careers and continually setting back our lineups. I believe Felton's led us just about as far as he'll ever be able. Scott Drew is sticky with the goo that oozes off of AAU ball. So much so that he hired the AAU coach of a stud recruit to be an assistant. In addition to the above points, Baylor is a less-than-attractive, rather limiting Baptist school in a less-than-attractive Central Texas small town often known as Wacko. It is nowhere near the overall package in terms of resources, living environment, and university that UGA is. The fact that our basketball team is this bad is kind of amazing; it's as though we really had to work at it given the talent in the state and lack of regional competition. All that said, the Harricks ought to be an object lesson that you would think this AD and this university learned during the Jan Kemp years. Like Madoff's ponzi scheme, academic fraud always eventually turns up and will certainly get a program relegated to irrelevance. By AD I mean "athletic department." Sorry for the confusion. I would argue the Dogs are perhaps the least relevant basketball program in any major conference. Such a status is simply unacceptable and the blame falls directly on Dennis Felton's shoulders. The program needs a change, irrespective of what recruit may or may not be signed. Isn't six years enough to prove incompetence? Quinton, agreed. But we do have Spike. So...there's a chance at greatness right there. On a serious note, Felton must go. It's as simple as that. Echoing the earlier comments, one recruit doesn't make a PROGRAM. UGA basketball is disgrace. There is no excuse. The students and alumni deserve better. 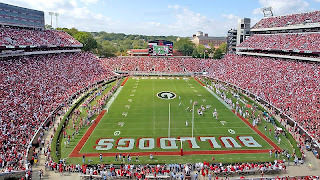 UGA has an outstanding athletic program with one glaring exception. A new coach is a must. A new arena is a must. Others will disagree. Personally, I think Stegeman (sp?) is a hole. My father played in the first game there - so I have sentimental reasons to love the place - but I don't. It's an embarrasment. Yes, I've been there this year. Yes, they have made it better. Yes, it's still a hole. Beat Tech. I hate them now more than ever. Yes, Stegeman is an embarassment and reflects a lack of commitment to the program. It was a bad arena even when it opened, and it's still a bad arena now. The Harricks didn't hurt anywhere near what Tubby Smith did to the program. We all expected Harrick to cut corners and just hope he wouldn't get caught. Tubby "slam-bam, thank ya maamed" us right at the point UGA was beginning to be a factor. Of course moving from a guard based team to a front court oriented team has caused some problems. Especially considering UGA has never had an intimidating big man up front. Tubby Smith is a treasure, anon11:55. A treasure. I want to thank him for gracing us with his presence. Blaming Tubby Smith? Seriously? Who wouldn't have taken the UK job? There are probably about 5 premier, "dream" jobs in NCAA bball. Duke, UNC, UCLA, UK . . . If anyone is to blame for the fact that UGA isn't a basketball "program" it is Vince Dooley. YEARS of systematic neglect and short sighted decision making (Jirsa?) and the desire for UGA athletic department to be beholden to the footbaw are some of the reasons that Stegeman is a hole, that we aren't a "program," that we are in year 6 on a "gap-bridging" coach. Things are headed in the right direction with Damon and the AA. Well said anon 12:09. If ANYONE is to blame for our horrific hoops status it is Vince. Just ask Hugh Durham how hard it was to work for Vince. Tubby left the team so full of players that they were more successful for two years after that than they have been in the last six even with that buffoon Jirsa coaching them! It should take no more than 2 years to turn around a major college basketball program. Harrick has no bearing on the current status. I have always defended Coach Felton as a good coach who just can't recruit/keep good players. He beats Tech every other year and who would argue that we have better talent than the Nerds. If he beats Tech tonight however they should fire Hewitt. Even hotel Paul can't screw up this one. As for Felton I would hope he would just resign gor the good of the program. If he gets Favors I would give him one year and then he and Favors will both be gone. Favors to the NBA and Felton wherever. If you really care about the state of the basketball program the coach who should be fired is Andy Landers. He annually coaches down some prety good talent, or just gives up on them and we never win a big game. Watch him on the bench. Looks like he just gives up or would rather chew out his girls than coach em up. He is a joke and getting worse annually. If he were coaching a mens program he would have been gone long ago. I hear that after retirement Landers is going to team up with Gene Keady on a new throwback hair gel product. "Dapper Dan," I think they're going to call it. Agreed. Landers is terrible and gets a pass because of his long past success. He does less with more than any coach at Georgia, and has the program in a slow decline. I've always thought Stegman would make a great indoor practice facility for the f-ball team. I have suggested this, with the assumption we would build a state-of-the-art gym somewhere else on/near campus. Now I think we ought to convert Stegman to a practice facility and not bother with building a new gym. I mean really, would anyone notice? The girls could play at Ramsey or something. I guess the Brock and Bridle Club would need a place for the rodeo, but we could come up with something. Either way, I'm more concerned with improving our football team in any manner than worrying about basketball. And you are a part of the problem, anon 315. BTW, rodeo hasn't been in coliseum in YEARS. Not that it too much consolation for being bad for this long under Felton ... but SEC basketball as a whole is BAD. So far this season SEC teams have lost to Mercer (twice! ), Oregon, Missouri St., Dayton, Northen Iowa, Loyola Chicago, WKU, Texas A&M Corpus Christi, VMI, San Diego, Southern Miss, Charlotte, College of Charleston, Illinois - Chicago! None of these teams, zero, zilch has a snowballs shot at the NCAA title. Sadly neither does a school in our 12 team conference. I think one factor in this equation is that basketball is a non-factor at 10 of the 12 schools in our league. I think not enough people care and the few that do have no influence. When does baseball season start? When are the gymnasts competing?